Jim Tresselis the head coach of the Ohio State Buckeyes football team. Since taking over the reins in 2001, Tressel has guided the Buckeyes to seven bowl appearances, including five BCS games; five ten-win seasons; fourBig Ten titles; and one national championship. 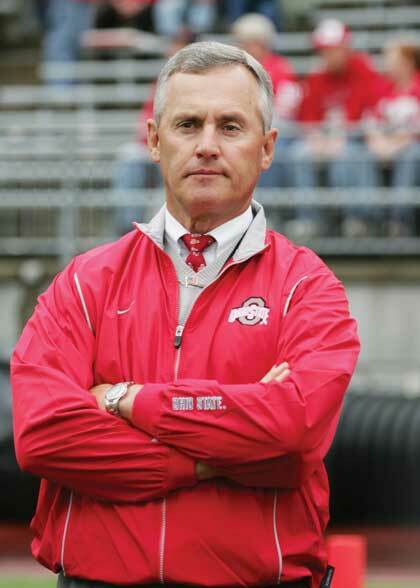 Prior to coming to Ohio State, Tressel spent fifteen seasons as head coach at Youngstown State University, where he was a four-time pick for the Division I-AA National Coach of the Year award. Coach Tressel has an overall coaching record of 208-72-2 and is ranked twelfth all-time in Division I coaching victories. In the course of his twenty-plus years as a coach, Tressel has been named the Chevrolet National Coach of the Year ('93, '94, and '97); the American Coaches Association National Coach of the Year ('91, '94, and '02); the Eddie Robinson National Coach of the Year ('94 and '02); and the AFCA Regional Coach of the Year ('87 and '93). He has also been selected seven times as Ohio Coach of the Year. Coach Tressel is actively involved with the American Football Coaches Association, the Fellowship of Christian Athletes, Alpha Tau Omega, The Ohio State University Medical Center, and the William Oxley Thompson Memorial Library. He and his wife also work on behalf of the Alzheimer's Association of Central Ohio, the Columbus Children's Hospital, the Tressel Family Fund for Cancer Prevention Research, Ronald McDonald House, the Youngstown State University Minority Student Endowment, the Mount Carmel School of Nursing, and the Jim and Ellen Tressel Athletic Scholarship Fund. Coach Tressel and his wife, Ellen, live in Upper Arlington, Ohio. They are the parents of four children: Zak, Carlee, Eric, and Whitney.